Maria Pinto is a Chicago-based designer who provided most of the perfectly tailored sheath dresses that Michelle wore on the campaign trail before Barack Obama became president. In fact, the night that the Obamas found out that Barack was the new President of the United States, Michelle was wearing a purple Maria Pinto sheath. Maria Pinto started as an assistant to Geoffrey Beene, and later debuted an accessories collection at Bergdorf Goodman. After a total label reboot in 2004, she drew the attention of Michelle Obama as well as other names, and sells her pieces through high-end stores like Barney’s, Saks Fifth Avenue, and Takashimaya. The famous one-shoulder, ivory gown that the First Lady wore at the inauguration ball was designed by Jason Wu, who covered the gown in Swarovski crystals and organza appliques. At the 2013 ball, she wore a red velvet and chiffon Wu. She’s also worn his work elsewhere; her Barbara Walters interview included a silk dress with embroidered rosettes by Wu, and her first cover on Vogue was in a magenta Jason Wu silk sheath. She’s also been seen in a Wu coat when she and Barack visited the Queen of England, as well as a teal dress by Wu during her visit to the Royal Opera House. Jason Wu is a New-York based designer from Taiwan, whose clients have also included January Jones, Amber Valletta, RuPaul, and Ivana Trump. As of 2013, he oversaw the womenswear branch of Hugo Boss. One of the most well-known images of Michelle Obama is from election night, 2008: Her red and black dress caused a polarizing debate among critics: some loved the bold style, while others found the criss-crossing belt in the middle to be a total fashion faux-pas. Whatever your stance, there is no denying that this dress, designed by Narcisco Rodriguez, drew attention. This Cuban-American designer also provided the First Lady with her camel and black suit that appeased far more viewers with its classy color and cut. 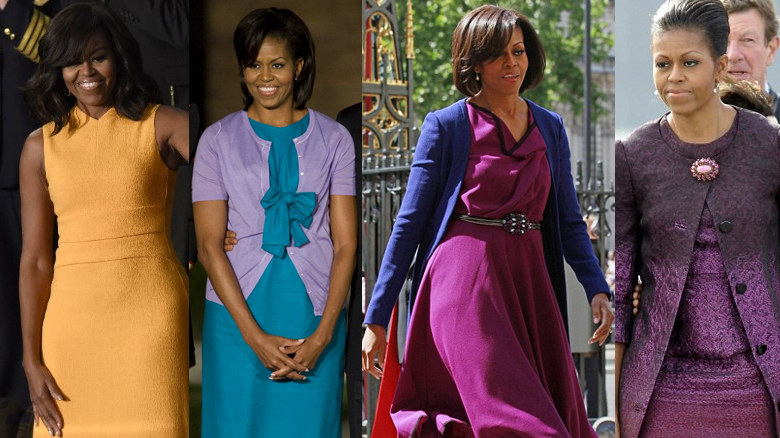 On her second cover of Vogue, Michelle wore a navy Reed Krakoff that reportedly came from her very own closet. During another 2008 inaugural event, Michelle was seen wearing a full-skirted floral dress created by designer Tracy Feith.